Route 16 is a small route that connects Route 15 with Ula’ula Meadow. It has a Pokémon Center which is perfectly placed for traveling Trainers to rest up their Pokémon. 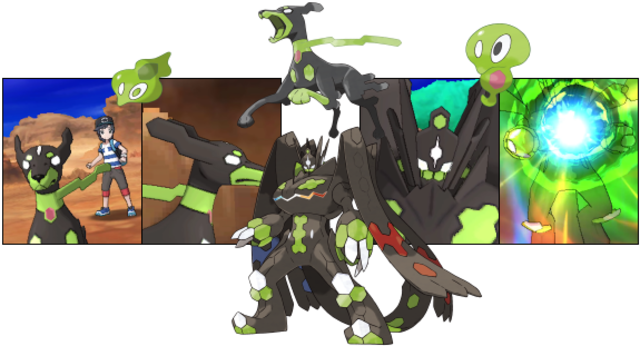 You can also start to combine all your Zygarde Cells and Cores here to create a Zygarde! Head over to the trailer on the right to start putting your Zygarde Cells together. At this point in the game, you’ll probably have around 10% of the Cells and Cores that you need to collect, so you should be able to assemble Zygarde in its 10% Forme. Click here to learn more about Zygarde Cells and Cores. Exit the trailer and look for a small crawl space located underneath it. You’ll find TM81 (X-Scissor) here. Pick up the Zygarde Cell on the left-hand side of the Pokémon Centre before entering. The woman seated on the left will give you a Lemonade if you visit the Pokémon Center Cafes often enough. If you show the woman dressed in white a Mimikyu, she’ll give you P20,000 – not bad! There’s not much do to here on Route 16 so you should now walk north towards Ula’ula Meadow. PP UpOn the east end of the route, near Scientist Reid. There are a number of Trainers dotted throughout the Meadow so you’re going to try to find and battle them. Golfer Dean won’t battle you until you’ve defeated all the other Trainers on the route so you’ll have to come back and find him later. Follow the walkway along and pick up the Zygarde Cell on the right (just off the walkway). There’s also a photo spot here where you can take photos of Oricorio (Baile Style), Ledian (day) and Ariados (night). 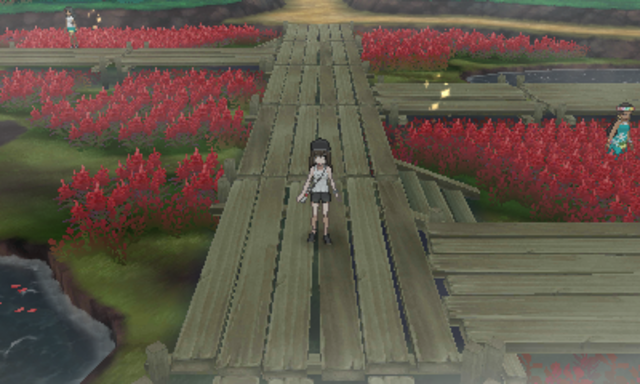 Continue following the walkway, and turn into the red flower patch in the middle to battle Dancer Mireille. You can pick up some Red Nectar here from the sparkling spots. Head back onto the path and walk round the bend to battle Office Worker Michelle. Pick up the Repeat Ball located in the middle of the meadow, on the east side of the flowers ringed by the walkway. Now turn left and battle Lass Rylee. Walk past her and through the tall grass you’ll find an X Sp. Def. Now go back on the walkway and go left into the flowers once again to find an Adrenaline Orb. Once you’re on the other side of the walkway, turn right and walk through the tall grass to grab another Zygarde Cell. You can now head back and battle Golfer Dean. He'll give you a Flame Orb when you defeat him. First stop is the Police Station! It’s full of Alolan Meowth, which seems a bit odd but you can pick up a Zygarde Cell inside the station, at the back of the building. Exit the Police Station, heading through the tall grass and up the mountain on the right-hand side. You can find a hidden X Attack on the mountainside, on top of the cliff on the west side of the first ramp. You’ll also see a Lemonade on your left. You’ll now need to use Tauros Charge to break the rocks ahead. Unfortunately, a Team Skull Grunt is waiting there for you. Defeat the Grunt and pick up the Full Heal behind him before heading back down the hill to the left side. Walk down the ledges to find TM84 (Poison Jab) and walk around the other side to pick up a Zygarde Cell. You’ll now have to battle another Team Skull Grunt. You can now go back to the main path. Follow it to battle two Team Skull Grunts, individually. There’s a Zygarde Cell on the left side of the Grunt which you can pick up on your way past. You should be able to see a door ahead. This will open and two more Team Skull Grunts will step out to battle you. After you have defeated the Grunts, a mysterious stranger appears and grants you access into Po Town.